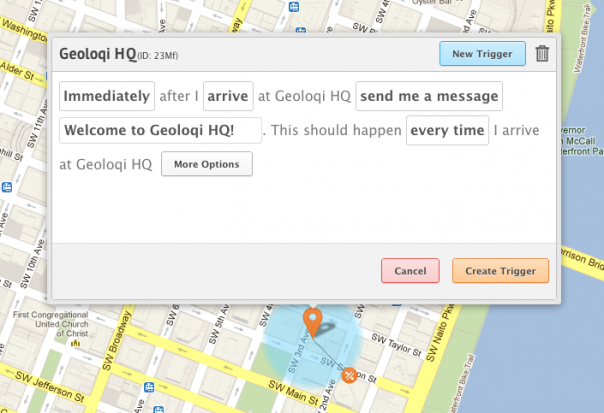 Today we launched the Geoloqi module for the Titanium platform, an easy way to add location to Titanium applications. This is a great step forward for location services. For the first time, Appcelerator’s 1.6 million developers have access to advanced geolocation tools and services right from their home base. Below is a sample of the press coverage we received today. 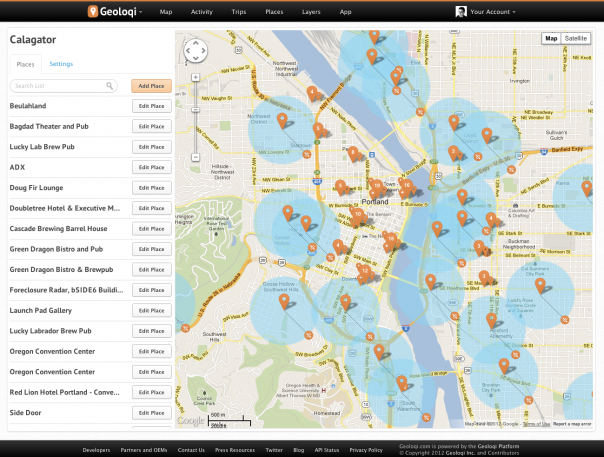 PORTLAND, OR – May 22, 2012 – Geoloqi, a powerful platform for next-generation location-based services, today announced the availability of the Geoloqi module for Appcelerator’s Titanium 2.0 platform. Geoloqi’s API and complete toolkit enable persistent location awareness with very minimal impact to battery consumption, so applications can truly behave in a context-aware manner. Its robust geolocation capabilities are now available to Appcelerator’s global network of over 1.6 million Titanium iOS and Android developers. Additionally, Geoloqi has made customizable geo-triggered events possible for the first time ever, which allow push messages and events to be directed to a single end-user at the moment that they cross into a geofence (a location zone that triggers a push notification or other action), dwell within it or depart the zone for a host of next-generation uses. Geoloqi also enables persistent/ambient background location tracking, and transitions smoothly between location sources such as carrier signals, GPS, Wifi and indoor tracking systems. The platform also provides rich location and dwell-time analytics, giving customers the ability to analyze location data for the first time. Its advanced security settings with easy opt-in and opt-out features ensure safety and privacy practices are automatically updated at any time. “Appcelerator has been a fantastic partner, with a very impressive set of tools. We are thrilled to be enabling their developer base with the power of next-generation location services for their applications and look forward to unleashing the power of the creative commons with powerful, easy-to-use location features,” said Amber Case, Geoloqi CEO and co-founder. Appcelerator is sponsoring a two-month free trial for all Titanium developers that register and download the Geoloqi Titanium module between now and June 30, 2012. To begin your free trial today, visit http://loqi.me/titanium. Geoloqi is a powerful platform for real-time location based services, and makes it simple for enterprise partners, OEMs and mobile developers to quickly add rich geolocation functionality to apps and devices. It provides a complete, real-time toolkit for tracking, messaging, battery management, geofencing, storage and actionable analytics, with a language agnostic SDK and proprietary API. Founded in 2011, Geoloqi is based in Portland, OR and backed by the Portland Seed Fund and TIE. For more information on Geoloqi, please visit http://www.geoloqi.com or follow Geoloqi on Twitter. Appcelerator’s Titanium is the leading mobile platform of choice for thousands of companies seizing the mobile opportunity. With more than 40,000 applications deployed on 50 million devices, Appcelerator’s award-winning Titanium Platform leverages over 5,000 mobile device and operating system APIs to create native iOS, Android, and HTML5 mobile web apps. Customers who standardize on the Titanium Platform get to market 70% faster and can quickly optimize business results with analytics-driven insights into user behavior and app performance. Open and fully extensible, Titanium makes it easy to integrate data, content and services from a variety of sources into mobile applications to leverage best-of-breed capabilities. Appcelerator Cloud Services (ACS) provides instant social, location, communication and content features for user-centric mobility. Appcelerator’s worldwide ecosystem includes 300,000 mobile developers and hundreds of ISVs and integration partners. To learn more visit www.appcelerator.com.